With Billy the Brompton we already had one slick folding bike in our household, the question arose as to whether we would buy him a playmate or not. Now buying a Brompton is not a decision one takes lightly, especially since it has certain needs like maintenance, affection and the obvious TLC. So we slept on it for a night. All jokes aside, the real question was if we actually needed another Brommie. Keeping its compact size when folded in mind, it would mean new opportunities for the occasional daytrip or weekend out. Just pop those babies in the trunk of the car and the options are unlimited. 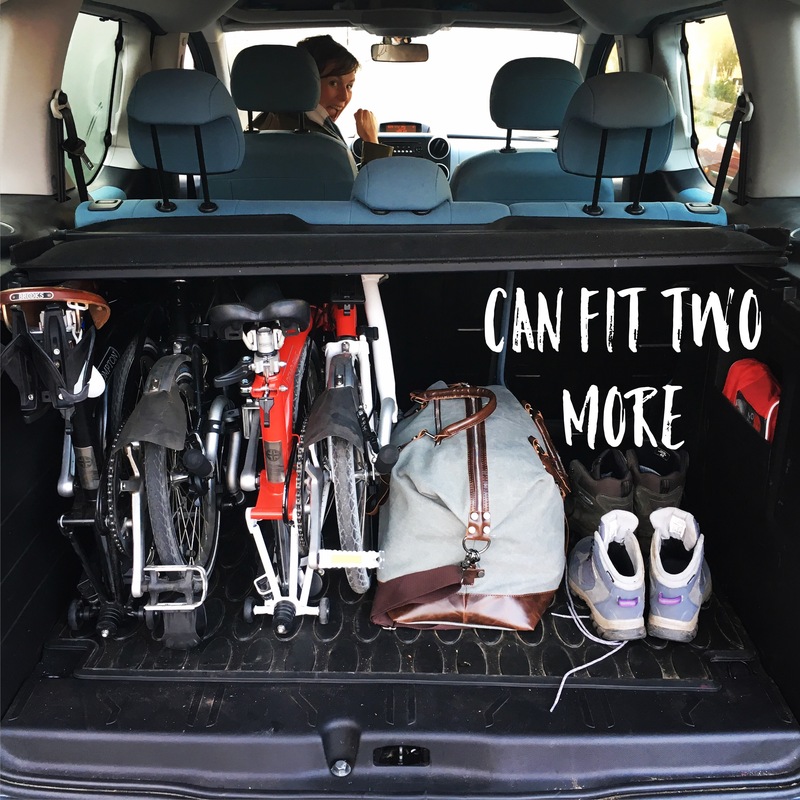 We tried it with a demo bike and there was room to spare for two more folding bikes. So yes, another Brommie didn’t sound like a bad idea at all. Excellent plan if I may say so. Since I had already chosen the first bike, I quickly crowned myself as expert Brompton buyer. Billy the Brompton was kindly passed on to my better half and the new bike would be chosen with upcoming races in mind. May I present you this ravishing beauty named Black Betty! What we have here is a basic black S3L model. That means three speed gearing (+8 %), a handle bar fit for racing and mudguards to tackle Belgium’s ever changing weather. No Schwalbe Marathon tires on Betty but the smooth and slick Schwalbe Kojak ones. Does anyone know if these were actually named after 70’s TV icon Kojac, played by Telly Savalas? I mean, Telly and the tires are both ‘bald’ so it’s a fair guess no? Thoughts on the bike? I love it. Not only does it look cool as F – wait, swearing is a nono, right – it’s also easier to push to a higher speed. My only concern now is if I’ll be able to ride this baby all the way to Oslo this summer. We’ll see I guess.